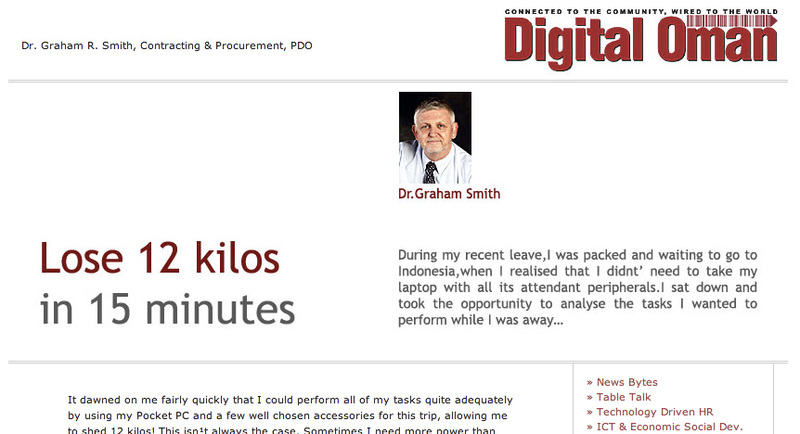 It is now nearly a decade ago when I wrote about dumping the laptop in favour of the PDA (Personal Digital Assistant), then they were all the rage and you could do almost anything you needed to as long as you put a little thought into it before you travelled. Not so these days with tablets and smart phones, you have everything at your disposal and if you don’t have it on your tablet or smart phone look it up in the App store, its bound to be there. I am still travelling throughout the globe with an iPhone and now an iPad Air. With both of these devices I have got everything at my fingertips, even documents that I have built previously I can now store in the cloud and pull them down at will. A good travelling companion is Dropbox which stores almost anything, pictures you have taken, video’s and documents as well. What software do I travel with, well using apple products now I use pages for word processing, numbers for spreadsheets and of course keynote for presentations. All of these products are compatible with the Microsoft Office products and to be honest when travelling I find them much better to use whilst on the go. They do the job very well and can be converted to the MS office opposites. Recently, I have purchased a stylus for the iPad as sometimes its easier to write the notes rather than type them in a meeting. The Adonit Jot is an extremely good stylus and has a normal pen inside as well, so you can fill in those landing cards on the plane or at the airport. I think the only things really to consider these days is what do you want to put on your device to entertain yourself when travelling, I always put some films or TV series, music and a book or two. Obviously buy a headset that you can use with the iPad to listen to the films or music. Finally remember that where you are going may not use the same electrical sockets as you do at home. You can purchase good converters for all countries these days or you can buy for the iPad and iPhones special travel packs of plugs to fit the chargers. All in all, i travel with a lot less these days than I ever did before, what will happen next I ask myself. This entry was posted on December 13, 2013 at 2:20 pm and is filed under Related to Supply Chain. You can follow any responses to this entry through the RSS 2.0 feed. You can leave a response, or trackback from your own site.